"Carl and Mindy are gone, OK? They've been taken over or replaced by something that doesn't require a head to function." Don't let the cover fool you, this is not simply a killer bug movie. Infested combines unlikely elements from The Big Chill, Night of the Living Dead, and even a touch of Psycho into a refreshingly clever and funny horror film about a swarm of mutant flies that descend on an unlucky group of friends. Writer/director Josh Olson starts the fun by executing a spot-on spoof of The Big Chill, where a group of 30-something yuppies have gathered in the country for the funeral of one of their own. The funeral in Infested serves as a reunion of sorts for the ten former college pals, who include an actor (Zach Galligan), a dot-com couple (Tuc Watkins and Camilla Overbye Roos), a journalist (David Packer), and a conspiracy nut (Robert Duncan McNeill) among others; even former Pink Power Ranger Amy Jo Johnson shows up as the dead man's girlfriend. That's just the setup for the fly infestation, and Olson actually takes his own sweet time getting to anything remotely horrific. The fun he pokes at The Big Chill is well-executed parody as he moves quickly from character to character, allowing snippets of random conversations to paint an easily identifiable thumbnail sketch of each person. There is a comically strange graveside eulogy read by a morose minister (Mark Margolis), and instead of Motown bonding the group together in a spirited dance sequence it is quirky 1980s pop from Trio (the infectious Da Da Da). Then out of nowhere the flies come and it gets ugly. Olson doesn't even waste time trying to explain origins or intentions, it is simply enough that an unexplained swarm of mutated flies need to lay countless eggs inside a human host, which will then explode out in a shower of bad CG effects. The flies turn each human host into a zombie-like creature impervious to any pain (one infested character actually pulls off his own head, and lives to cause even more trouble). The yuppies are trapped in a rural country home, as the flies (and their zombie minions) slowly pick off one character after another. I have to say that the endless special effects of the flies pouring out of victim's mouths are absolutely awful, and look really, really bad. Now normally that would be a death knell for a horror film, but Jack Olson has written such terrific dialogue (much of it delivered by Robert Duncan McNeill's conspiracy-addled Eric) that I actually didn't care as much for the flies as I did for the reactions and interactions amongst the group of survivors. 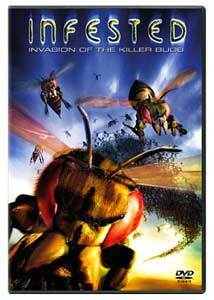 This is a surprising little B-movie horror flick, full of humor and parody; plus, you have to love any movie where Amy Jo Johnson tears a guy open with a shovel, and one where Trio's Da Da Da just might have power over a swarm of mutated flies. Image Transfer Review: Infested is presented in a nice looking, largely blemish-free 1.85:1 anamorphic widescreen transfer. Colors and fleshtones are reproduced accurately and warmly, with decent black levels. Some of the basement sequences play a little too dark, but those are infrequent enough to not be a bother. I did notice minor ringing on some shots, but it was tolerable. Audio Transfer Review: A lively English 2.0 surround track is the only option here. Dialogue is well mixed, easily understandable and the rear channels are used more often than a lot of so-called 5.1 tracks I've heard. This isn't an audio reference disc by any means, but it is good, and definitely enhances the viewing experience. Extras Review: Boy, I bet a Josh Olson commentary would have been fun, but no such luck. Instead, all Columbia TriStar has included is three trailers (Infested, Anaconda, Creature Features), 28 chapter stops, and subtitles (English, Spanish, Chinese, French, Korean, Portuguese, Thai). This is dumb, fun, satirical horror, and I don't even care that much about the tacky special effects. If the effects were better, Infested might have been just about perfect. As is, though, the characters are funny, and Josh Olson has given them some laugh-out-loud dialogue in this The Big Chill meets Night of the Living Dead gem. Highly recommended for genre fans.